The “T-55 Enigma” (or Enigma, for short) is the unofficial name for an upgrade standard applied to a few Iraqi T-55s. According to some Iraqis, the official name was “Al Faw”. As the western name suggests, very little is known about the T-55 Enigma aside from what can be ascertained from models captured during the First Gulf War (1990-1991) by Coalition forces. In short, the upgrade concerned giving the vehicle a huge amount of crude, but effective, composite armor. However, Enigmas suffered from one major flaw – being based on an outdated chassis. As a result, in their short combat history, Enigmas were simply no match for Coalition forces, even if the vehicles could (sometimes) resist AT missile strikes. It is estimated that no more than eight (but no fewer than five) Enigmas ever existed (based on photographs), with at least four (possibly five) on display in museums today. T-55 Enigma serving as a gate guardian for the 203rd Military Intelligence Battalion, Aberdeen Proving Ground. The turret DShK has been removed, but the mount is still there. The example at Bovington, too, has this mount, but some other Enigmas do not appear to have been fitted with DShKs at all. The Enigma appears to be little more than a T-55 with a crude armor upgrade. Essentially, large armor boxes have been fitted to the turret and front and sides of the hull. These are held in place mostly by bolts and brackets. These armor boxes are composite armor – inside the steel boxes are four plates of steel and rubber which are spaced apart by a few centimeters, although at least two captured Engimas did not use rubber sheeting. It seems likely that the idea was to try to create an armor upgrade that can resist HEAT shells (High Explosive Anti Tank) and ATGMs (Anti-Tank Guided Missiles). This was no doubt a lesson hard learned in the Iran-Iraq War (1980-1988), in which both sides used missiles such as the BGM-71 TOW, AGM 65 Maverick, and similar missiles in an anti-tank role to devastating effect. Post-capture testing by Coalition forces has also proven that the armor is resistant to HESH (High Explosive Squash Head) shells. T-55 Enigma armor thickness diagram. The Enigma has a total of thirty-two armor blocks added. Eight blocks of armor are mounted on either side of the hull mounted on brackets, two large boxes are riveted to the upper glacis plate (with two small boxes above the front mudguards to cover an otherwise bare area), eight blocks are fitted to the turret (two with hinges to allow the driver to enter and exit his hatch unimpeded) on brackets, and four thin boxes are fitted to the rear of the turret on a counterweight rail. As a result, the weight of the tank was increased to an estimated 41 t, compared to the T-55’s 36 t, no doubt making the tank a lot less agile. How crudely built were the Enigmas? The Enigma was evidently a crude and cheap upgrade package. 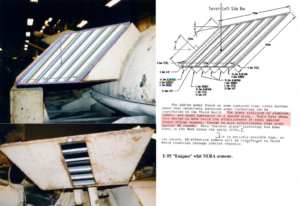 Visible examples of the design’s crudeness include the low-quality materials used in the armor boxes, the fact that the armor boxes are hardly standardized (with few being the same exact size), the sheer number of poor quality weld beads, and some of the armor being only bolted or bracketed onto the vehicle. 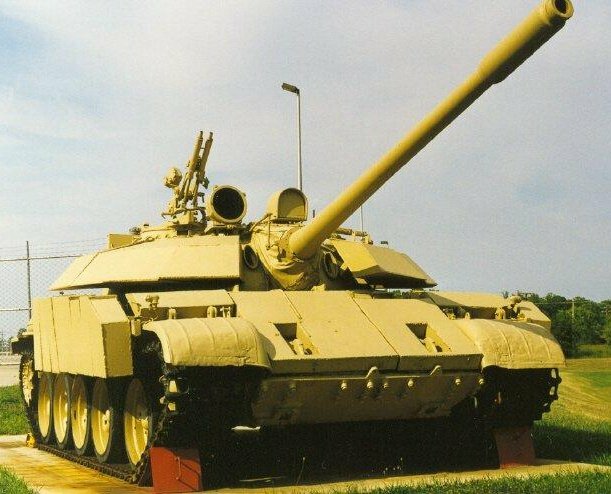 Worse still, the armor has numerous gaps (compared to something such as the T-90AM, with no gaps in its Explosive Reactive Armor) that a missile could easily slip through – for example, the gun mantlet has had no further uparmoring. The turret armor box above the driver’s hatch can lift up to allow access the driver’s hatch. A turret armor block on the far right of the turret can lift up, most likely to allow access to the engine. This would mean that the turret would be traversed to the right, and the armor box could be lifted out of the way of the engine access hatch. The two upper glacis plate boxes have rectangular holes in them to allow access to the towing hooks. The inclusion of the turret counterweight. 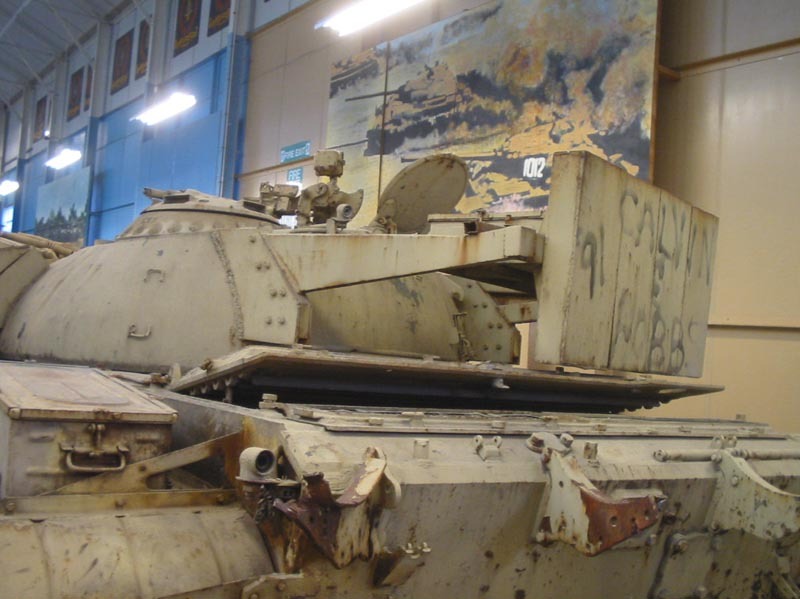 All of the vehicle’s external lights have been carried over from the T-55 before conversion, and have been rewired and mounted onto the new armor. Most photos show the vehicles looking very worn, often with chipped paint and sometimes even rust. Keep in mind that these photos are of the vehicles after combat, as opposed to ‘factory fresh’. Similarly, the T-55s used for the conversion were also at least a few decades old, anyway. All in all, the Enigma upgrade should not be seen as hasty, improvised, or poorly thought out, but rather cheaply done with crude materials. The design history of Enigma is unknown, but some details can be worked out from the context. The first Enigma was actually based on a Type 69-II and was presented at the Baghdad Arms Fair in 1989, but this does not mark the start of the project. The start of the project is likely to be closer to the later Iran-Iraq War. The actual production run of the Enigmas has been narrowed down to between 1988 and 1990. This is because Enigmas were first encountered in First Gulf War at the Battle of Khafji (29th January – 2nd February, 1991), and because the first Enigma package (the Type 69-II at the Baghdad Arms Fair was possibly even a prototype) was first seen in 1989. Assuming this to be true, it can generally be assumed that the project started, at earliest, towards the end of the Iran-Iraq War. Given that Enigmas were encountered in January 1991, this only gives an approximate three-year window for the conversions to have taken place – 1988-1990. 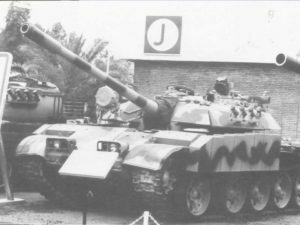 Of course, it is also possible that the Type 69-II was not a prototype as such, but a demonstrator tank using the most modern hull available to show off to visitors. The reasons as to why the Enigmas were created seems fairly obvious. As mentioned earlier, it can be generally assumed that the conversion was a means of stopping modern missiles, but with a very small budget. Around this time, many cheap and crude conversions were made by Iraq. These include, but are not limited to, the T-55QM2 (which was actually a Type 69-II with a T-72’s 125mm smoothbore gun, and apparently a prototype only), the T-55/130 (a one-off crude SPG using a 130mm field gun based on a T-55 chassis), T-55/160 (a small number, estimated 18, of self-propelled mortar carriers on the T-54/55 chassis mounting a 160mm mortar), and the OT-62 Cascavel (an OT-62 with an EE-9 Cascavel turret mounted, also likely a one-off). These vehicles (and some other much more obscure conversions) were likely built in anticipation of combat with a markedly technologically superior force. 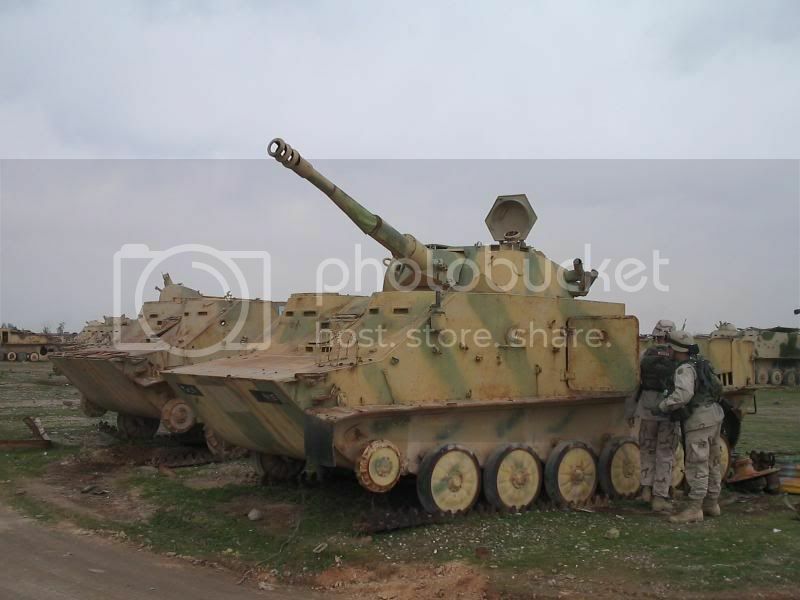 However, it is also possible that they were made as a cheap and quick means of rebuilding Iraq’s armored forces. 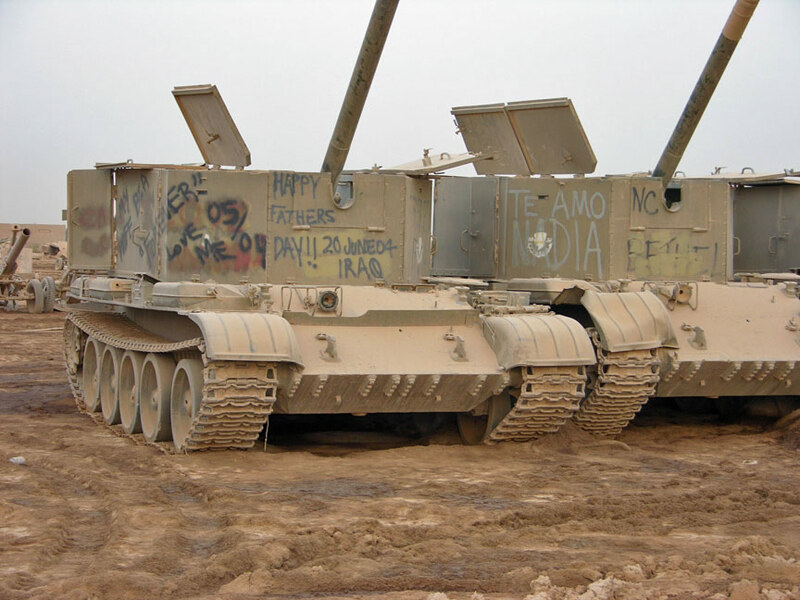 Many Iraqi tanks were knocked out in the Iran-Iraq War and needed replacing. 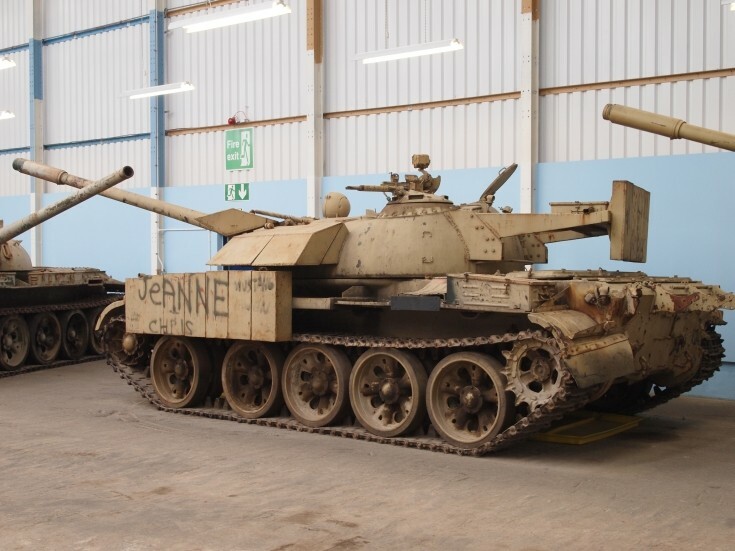 Iraqi arms production at this time was believed to be limited to local workshops and small-scale factories, which produced conversions such as the T-55 Enigma, assembled cheap tanks such as the Asad Babil, and made copies of Soviet and Chinese field guns. Iraq’s economy was devastated by the Iran-Iraq War, partly from buying so many foreign arms, but also from the fact that the country had been in a devastating war for eight years, with high casualties. Importing foreign arms was hardly a likely solution, either. Iraq was in serious debt to Kuwait and Saudi Arabia following the Iran-Iraq War. Demands for the debts to be forgiven were denied, and this would be a factor that led to the 1990 invasion of Kuwait. The invasion of Kuwait prompted the adoption of United Nations Security Resolution 661, which led to serious economic sanctions on Iraq, including the prohibition of arms deals to Iraq, which had effectively propped up the Iraqi army during the Iran-Iraq War. Given the context, it seems more than likely that the Enigmas existed as the absolute best that the Iraqis could produce to bring their AFVs closer to a modern standard. 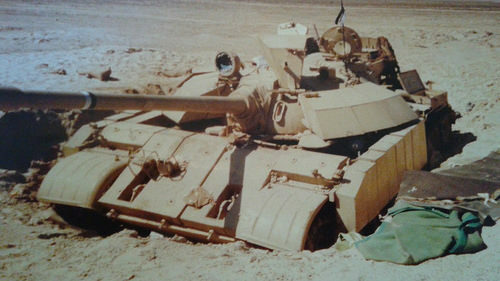 The T-55 Enigma was first encountered in the First Gulf War by Coalition forces during the Battle of Khafji (29th January – 2nd February 1991). Using occupied Kuwait as a base of operations, Iraqi forces invaded the Saudi border town of Khafji, northeastern Saudi Arabia. There, the Iraqis engaged the Coalition forces of Saudi Arabia, Qatar, and the USA. 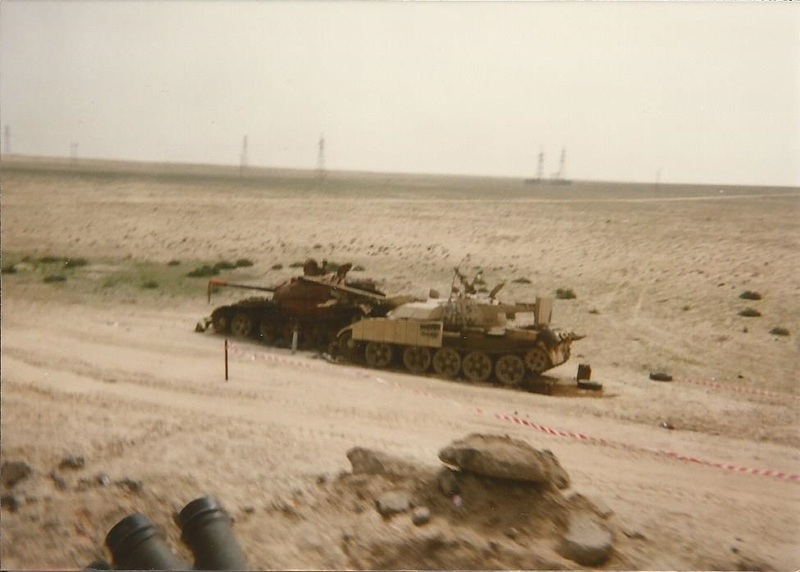 Involved in the battle were the Iraqi 1st Mechanized Division, 3rd Armored Division, and 5th Mechanized Division, who fielded BMP-1s, BRDM-2s, T-72s, T-62s, Type 69s, and T-55s (some of which were Enigmas). However, it remains unclear which Division the Enigmas operated, and how many there were. Enigmas are believed to have been operated as command tanks for battalions. Iraqi Armored and Mechanized Divisions were made up of three brigades, with each brigade having up to four battalions. No official Iraqi military documents confirm the Enigma’s use as a command tank, but judging by how they were fielded, this seems a likely conclusion. Coalition forces fielded AMX-30s, LAV-150 Commandos, and LAV-25s. They also, crucially, had strong air support from AC-130 gunships. It is reported that during the battle, the Enigmas could survive hits from MILAN AT missiles, although this was probably not a consistent occurrence. Photographs of knocked out Enigmas show that armor blocks would be sent flying by missile impacts, and the reliability of the armor at blocking missile hits is questionable due to the crude and somewhat unstandardized design. Similarly, the tank was not completely covered by the composite armor boxes. For example, one photograph shows that a missile hit the tank’s main gun, leaving a gaping hole, and an armor block was also dislodged by the explosion. Having said this, evidence suggests a direct hit to armor block was likely to be non-fatal in at least some instances. 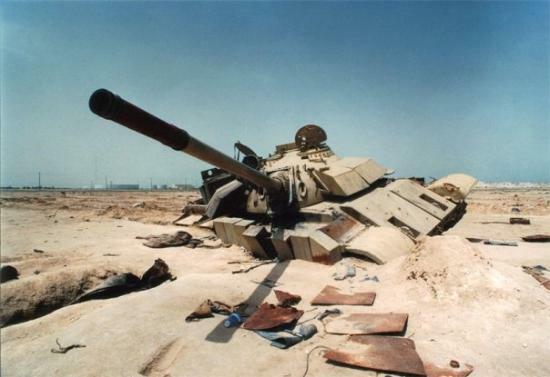 T-55 Enigma knocked out during the Battle of Khafji. It appears to have rammed into a Type 69 or T-55. Credits: AR15.com forums user “USMC Tanker”. On January 29th, a column of Iraqi T-55s (some of which may have been Enigmas) drove to the Saudi border, signalling an intention to surrender. As Saudi forces approached, the T-55s opened fire. An AC-130 responded to the incident and destroyed thirteen vehicles. On January 30th, a platoon of Iraqi T-55s (some of which may have been Enigmas) engaged a Qatari Tank Company of AMX 30s to the south of Khafji. Several T-55s were knocked out, and a fourth was captured. Unfortunately, primary sources and eyewitness accounts do not distinguish between the T-55 and the T-55 Enigma, partly because it was a near-totally unknown vehicle outside of military intelligence, but one must also consider that soldiers are not necessarily tank experts. 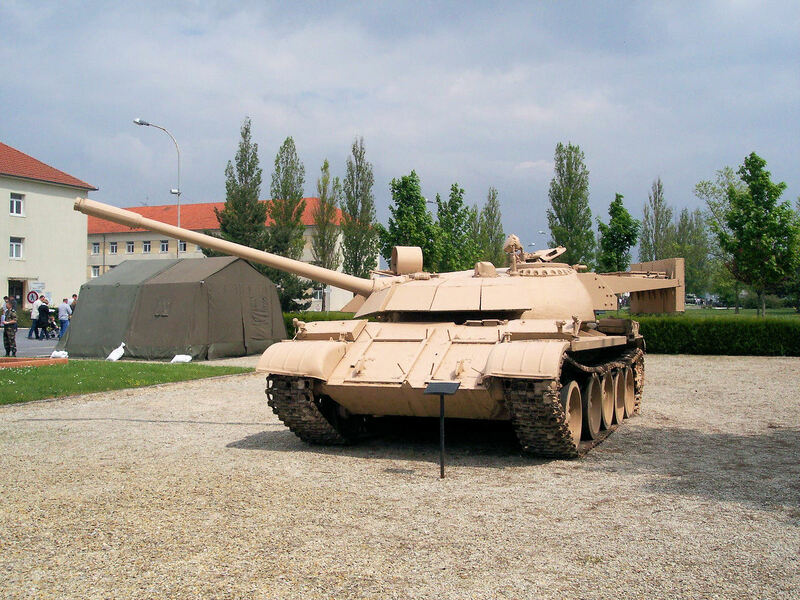 One was put on display at the Armor Center’s Patton Museum at Fort Knox in 2002. One is reportedly at Aberdeen Proving Ground, USA, but it is actually the gate guardian for the 203rd Military Intelligence Battalion, who are based at Aberdeen Proving Ground, Maryland, USA. One is located at Bovington Tank Museum, UK. This is the most famous Enigma with “Jeanne” graffitied on the side. One is located at Mourlemon-le-Grand, France. One Enigma is also reported to still exist in Kuwait. Post-combat photos from Coalition forces (mostly, if not exclusively, US soldiers) show that the Enigmas were gratified with the names of passing soldiers – most typical of this is the Enigma at Bovington. Secondary armaments, particularly the AA mount DShK, appear to have been removed shortly after the battle ended. The T-55 Enigma was a cheap upgrade to an outdated tank. 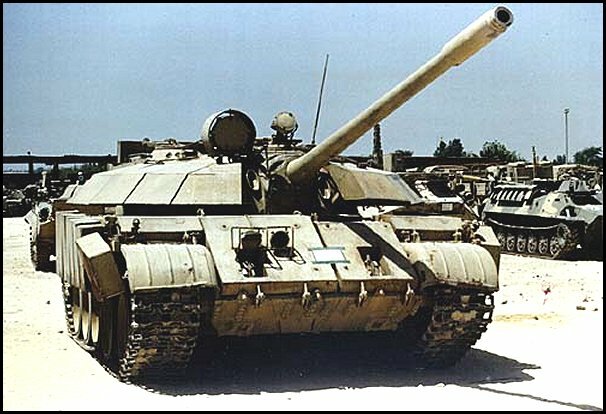 Whilst, indeed, the crude composite armor was sometimes able to fulfil its role, it did not make the T-55 Enigma comparable to its coalition counterparts, such as the AMX 30. 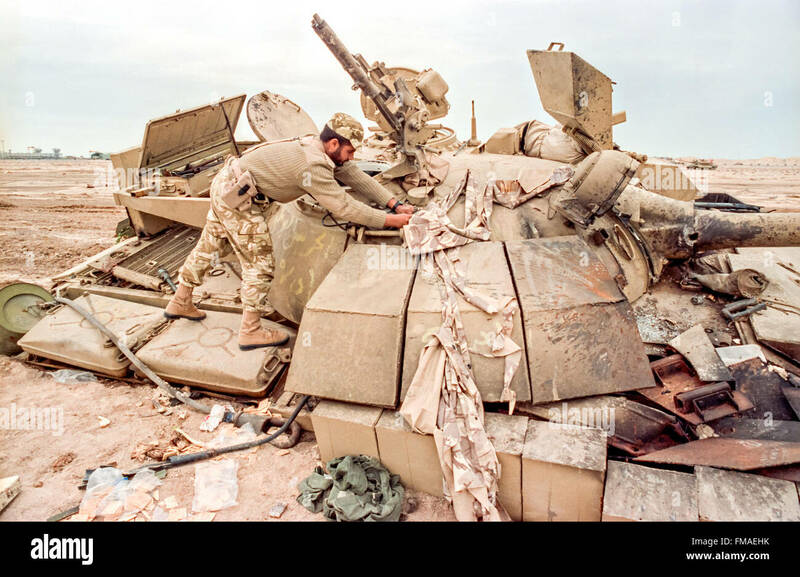 The Enigma upgrade was done in a very particular context – The Iraqis needed to defend against modern AT weapons and also needed to rearm themselves after the decimation of their tanks in the Iran-Iraq War, but had very little means of actually doing so. The Iran-Iraq War had devastated the Iraqi economy, and almost exhausted Iraqi military production capacity (with the exception of low-quality local production workshops). The 1990 invasion of Kuwait also prompted the adoption of United Nations Security Resolution 661, which meant that no modern arms could not be bought from abroad. In this context, the T-55 Enigma was quite an ingenious solution to these problems. Crude spaced armor and composite armor upgrades are all too common in desperate times and can be seen in various other conflicts such as the Yugoslav Wars, Libyan Civil War, and the Syrian Civil War. Outdated Soviet and Chinese tanks are still operated by many Third World countries, and it is almost certain that similar upgrades to T-55s, Type 59s, and similar vehicles will be seen in the future. 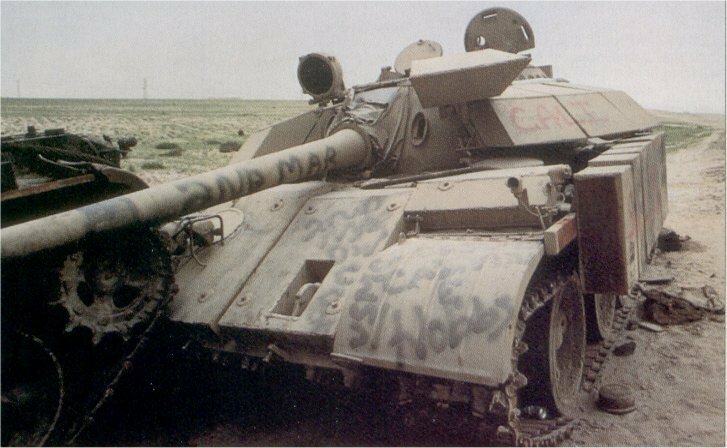 Standard Iraqi T-55 with DShK, Battle of Al-Amarah (1984), Iran-Iraq War. T-55 Enigma with DShK, Battle of Khafji (1991), First Gulf War. 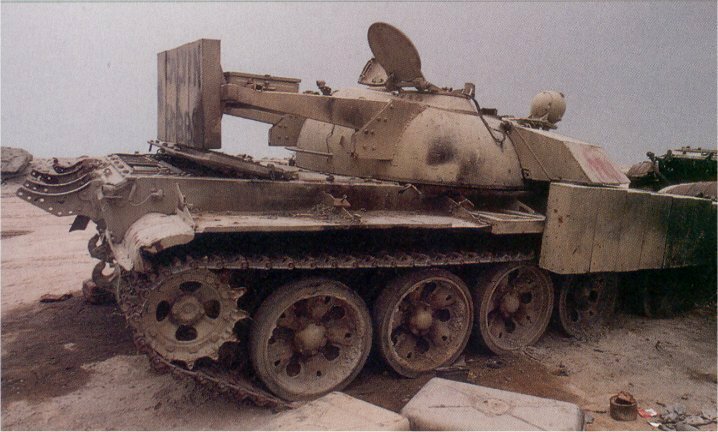 A T-55 Enigma knocked out during the Battle of Khafji. Pieces of armor boxes appear to be strewn around the ground, and were most likely knocked from their brackets after being hit by another tank. Type 69-II Enigma at the 1989 Baghdad Arms Fair. 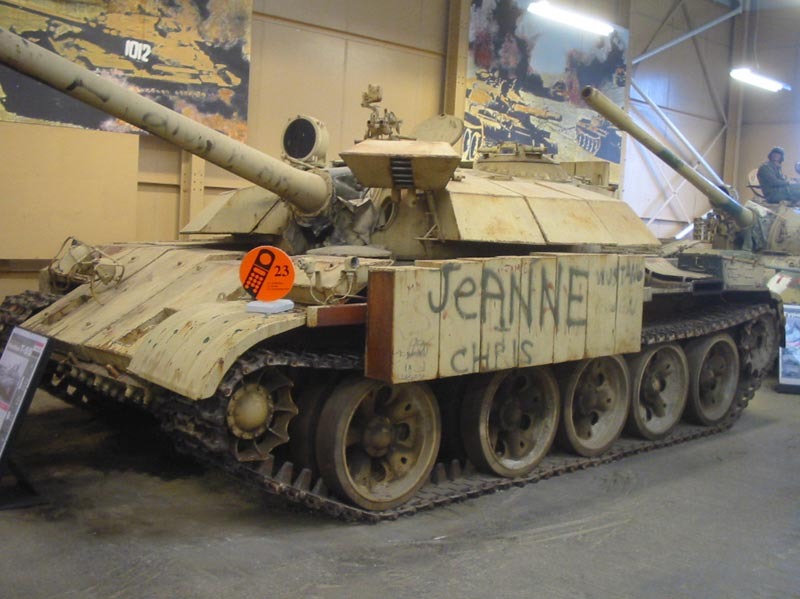 This appears to have been a one-off conversion, featuring more advanced technics than the T-55 Enigma, including improved headlights, and smoke generators. The two tone camouflage is likely dark green on sand. 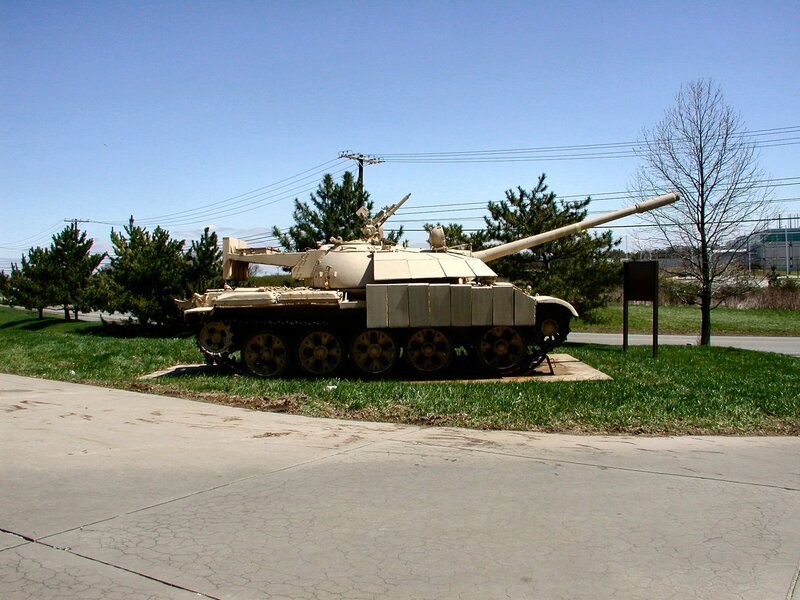 T-55 Enigma, serving as a gate guardian for the 203rd Military Intelligence Battalion, Aberdeen Proving Ground. The turret counterweight is clear in this image. Notice also that the side armor boxes are not the same height. 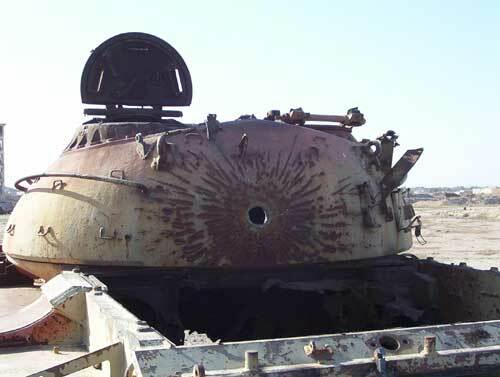 Knocked out T-55 Enigma at Khafji. It appears as though no armor boxes are missing, but the driver has most likely bailed out. Closeup of a T-55 Enigma knocked out during the Battle of Khafji, which has rammed into a Type 69 or T-55. This was some time after the battle, according to the amount of graffiti on the vehicle. 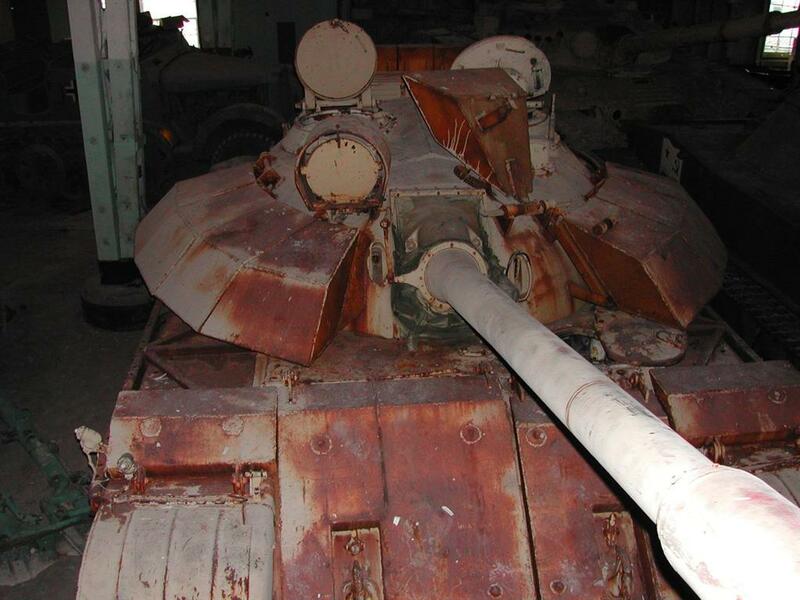 Captured T-55 Enigma, possibly in Kuwait, post-Gulf War. All of the original T-55’s lights are on the vehicle. Entry hole of a Maverick missile in the back of an Iraqi T-55 that was destroyed in 1991. Simply put, this is why the Enigmas were built. Judging by the condition of the tank’s paint and rust, this photograph was likely taken after the Gulf War had ended. I could be wrong, but it appears that the Enigma destroyed in the Battle of Khafji is the same one in Bovington, just based on the graffiti. The one I provide the most photos of, with the graffiti, seems to have slightly different graffiti on it. That’s not to say that over time, it wasn’t re-graffitied. I can’t say for sure. Lots of Enigmas were knocked out at Khafji, however. ATGM stands for anti-tank Guided Missile, not Anti-Tank Ground Missile. Just saying. I’ve noticed that many articles say “height” instead of “eight”. I wanted to send a private message, but I can’t find the email address, so sorry for posting this here. Interesting armor package, honestly. Could probably be upgraded, perhaps by putting resin or ceramics in the gaps. Enigma-II, perhaps? I always thinking why there is no other country, that still have T-54/55 or Type 59 (or even other T-series) replicate this design? Imagine an Enigma upgrade package with lightweight, advanced composite materials inside its armor blocks. Of course with flaws present in original Enigma fixed. The armor inserts can be obtained through cooperation with foreign defence manufacturers if they can’t built it themselves.